Kynesgrove is a sacred forest in eastern Eastmarch, south of Windhelm. The Keepers of the Grove live here and serve as priests of Kyne. Before going out in war, the local Nords used to go to Kynesgrove and pray to Kyne for good fortune. 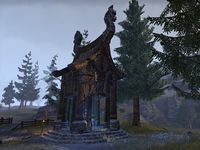 Kynesgrove Objective: Determine the cause of corruption at the shrine. Kynesgrove Wayshrine is located northwest of the woods. Keeper Ormi: the head keeper at Kynesgrove. Kynesgrove also appeared in Skyrim.